As one of the biggest names in hockey, Connor McDavid is no stranger to the hobby. Building on his growing supply of hockey cards, the young star is the main focus of the 2015-16 Upper Deck Connor McDavid Collection Hockey box set. The factory set includes 25 Connor McDavid base cards that chronicle his budding career, including his NHL Draft day, Team Canada participation and his NHL debut. In addition to the base set, there is also one Commemorative C-Card insert in each box. These over-sized card measure 3 1/2" by 8". While very rare, collectors can also find the insert as a signed parallel that is limited to only 17 copies. 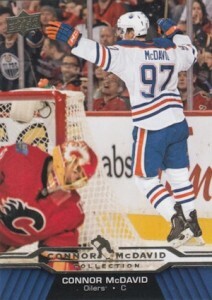 Outside of the newest cards from his time with the Edmonton Oilers, McDavid already has quite a few prospect cards and he was also featured in the 2015 Upper Deck Team Canada Juniors product. 25 cards. Shop for base sets on eBay. 1 per set. Card measures 3 1/2" x 8". But this kid good !!! Is there anything else on the checklist? I see that with each box you have everything except for the very limited auto (not having followed the hobby, I wonder how much these fetch as those kind of set are usually overprinted, � la Pro-Set, this rare parralel get ridiculous hard to get). This set has not been over produced since the 80’s opee chee, Unless you are only a collector do not bye this set or his cards! Sorry Connor! Just pulled 16 of 17 in first box…. how ecstatic can one be? I am still reeling from the excitement of pulling one of these limited c-cards in his white oilers jersey. 15 16 UD Connor McDavid Collection Factory Sealed Box-25 ROOKIE Cards+JUMBO RC!